Architecture and professional football cross paths in one of the latest projects in which PORCELANOSA Grupo has taken part. 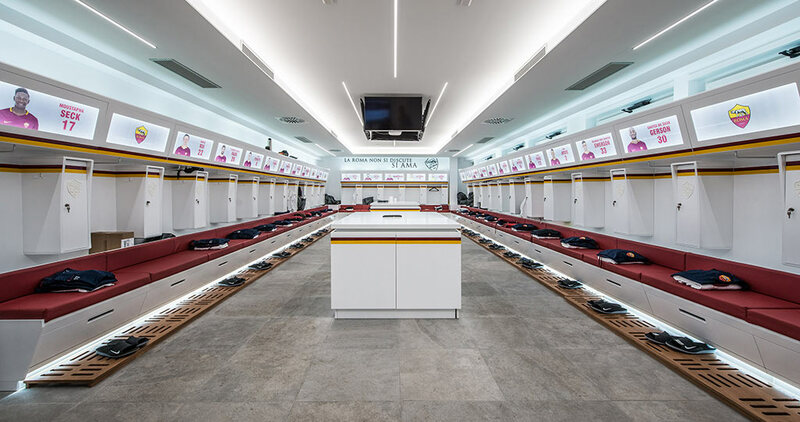 Specifically, the firm has collaborated by providing several of its products for the interior design in some of the spaces at the Trigoria Sports Complex, where the First Division team, A.S. Roma, and its reserve and youth teams do their training. The sportsmen and their technical staff’s corporate spirit and maximum comfort have been the two main aspects to bear in mind when designing the sports complex spaces. Additionally, the need of being provided with high resistance and durability materials and products has also been considered, since we are dealing with a high-demanding project which entails high traffic. 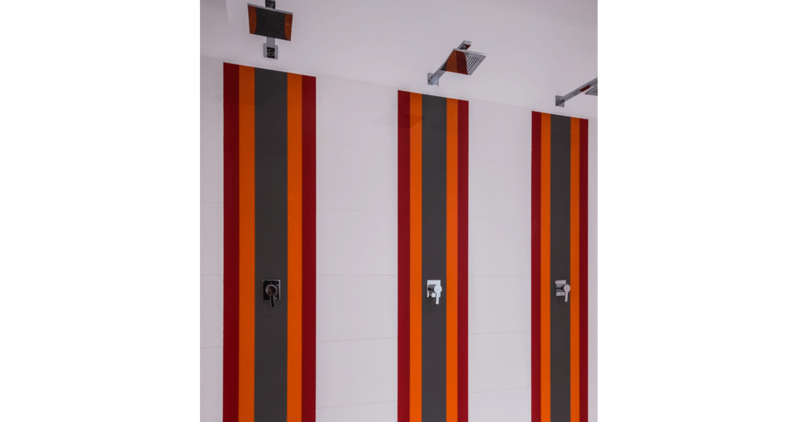 The Trigoria sports complex showers are one of the spaces where one can find exclusive designs manufactured with materials from the PORCELANOSA Grupo. 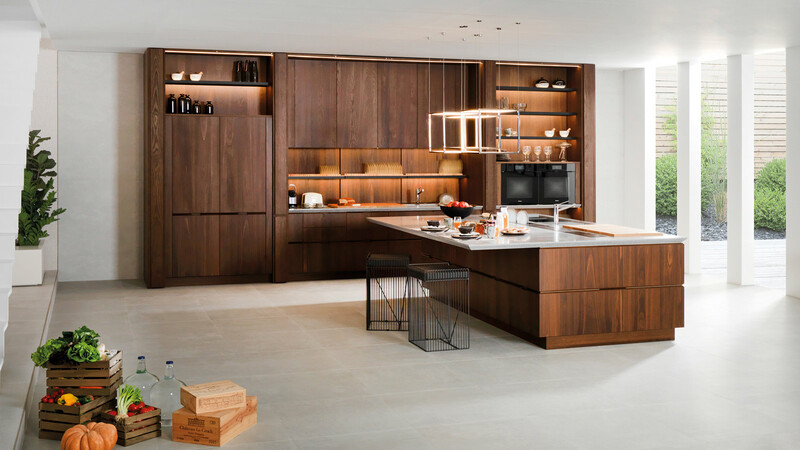 Since it is an atmosphere exposed constantly to both water and a high dose of humidity, the choice for the flooring was the full and low-porosity through-body porcelain tile by Urbatek, in combination with the rectified Marmi China PV ceramic wall tile by Porcelanosa. It is a tile with shades of white which perfectly intermingles with the high-resistant flooring by Urbatek, the Deep Light Grey Natural Anthracita model and inspired by cement. 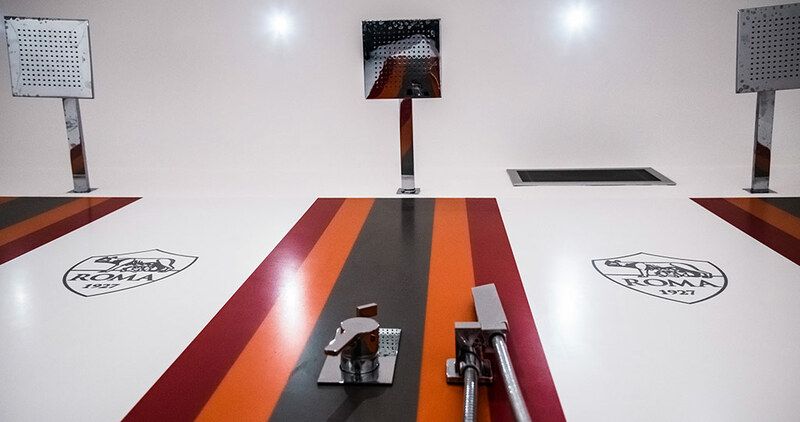 The KRION® Solid Surface mineral compact has been used as the distinguishing element since it creates vertical strips of the football team’s colours on the wall tile: KRION® Snow White 1100, KRION® Red Fire 6401, KRION® Fruit 6301 and KRION® Bright 6904. With regard to the shower space, it is also worth highlighting the bathroom equipment provided by Noken and Systempool. The latter offers the quality and minimalism style of its Architect shower trays, as well as its Land Stone shower trays and the Yove shower screens. 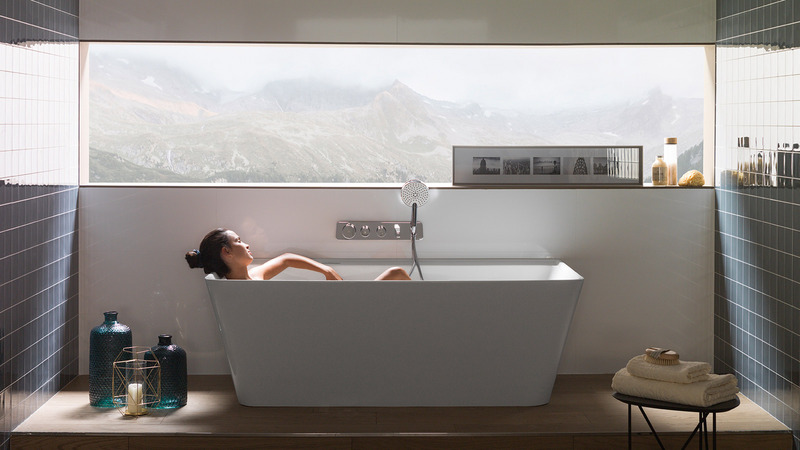 Noken, for its part, is in charge of the bathroom taps, the basins, sanitaryware and the shower heads. 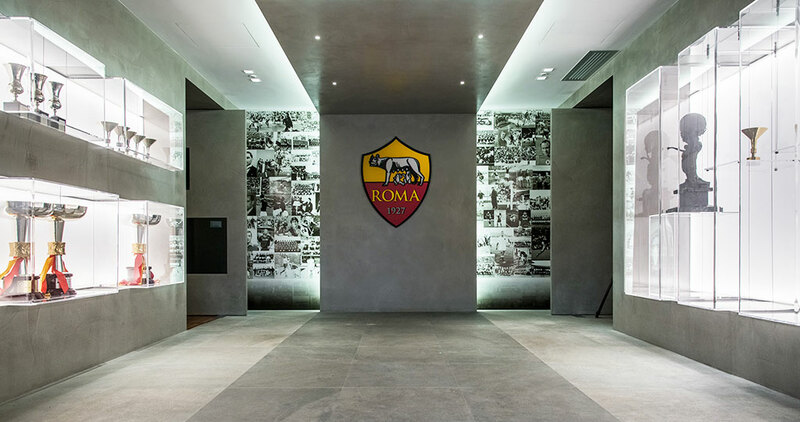 A.S. Roma has also banked on the Urban-C collection by Noken regarding the sanitaryware, specifically, the wall-hung bidet and toilet. The latter has been installed with the concealed Smart line system, which allows for bringing the toilet design to its simplest form and also for a reduction in space usage. 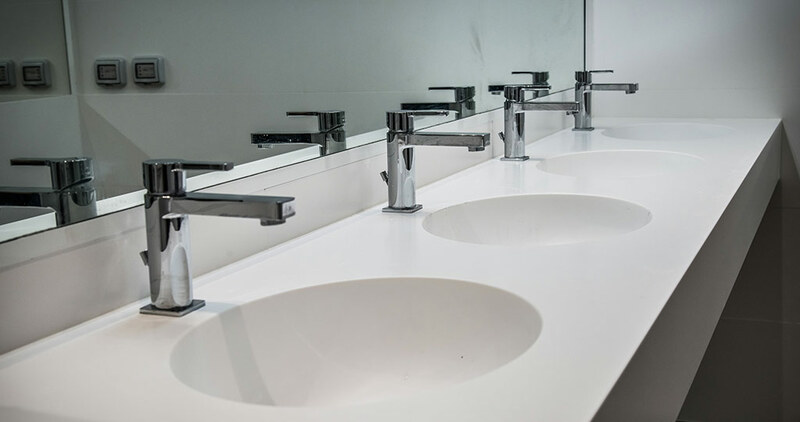 Regarding the basins, the Urban and City collections were chosen, whereas the taps and shower heads belong to the Urban and Neptune Slim Square series, respectively. 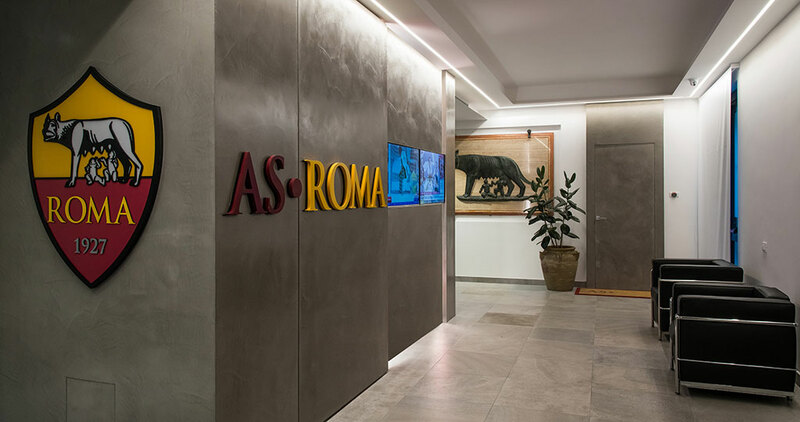 Apart from the Trigoria sports complex showers, PORCELANOSA Grupo is also present in other areas of the complex. In order to offer visual continuity in the design, and because of its high demand, the same floor tile by Urbatek has been installed in the communal zones, trophy areas and the entrance and corridors: The Deep Light Grey Nature through-body porcelain. However, for some of the outside areas, the ceramic parquet by Porcelanosa was opted for, inspired by the Oxford Castaño natural wood which provides its warmth in and around the training fields, the swimming pool area and the changing rooms. 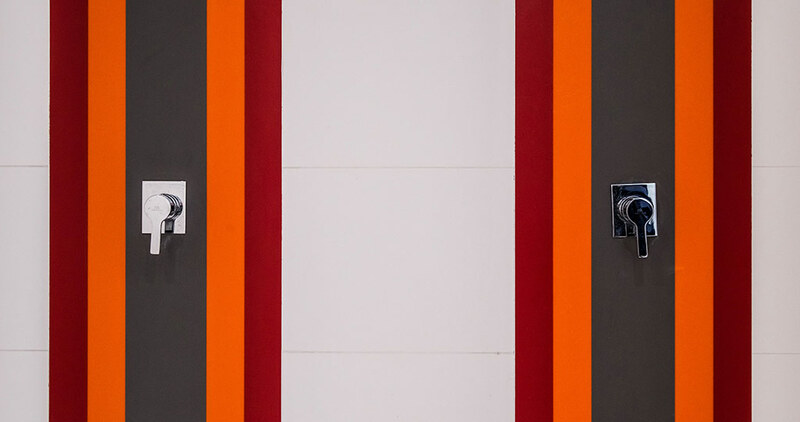 It is certainly a high-efficiency project full of high-level and exclusive materials with excellent performance.